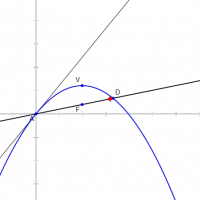 It turns out that (ignoring air resistance) the projectile with the maximum range on a sloping plane follows a parabolic trajectory where the focus of the parabola lies on the plane. Drag the red point to change the slope of the plane. Use the slider to change the muzzle velocity. Can you infer from the properties of a parabola that the initial direction of the projectile bisects the angle between the sloped plane and the vertical?